The past few years my dear friend has gone through very rugged terrain with her child. I watch helplessly as her Mother’s Heart breaks time and time again. Let me re-phrase: I feel helpless and yet I know my prayers for her and her family are heard and held by our Abba Father. He cares for her even more than I do and loves her lamb even more than she does. “He will feed his flock like a shepherd. God understands the Mother’s Heart. He formed it out of his own Great Heart. Yet unlike us, he is absolutely unlimited in his capacity to love, forgive, and even shape the circumstance he knows will draw a child back to his mother’s arms and his own. Is your heart breaking over a child who is determined to wander away from the green meadows God has for her? Know that your prayers matter. They are heard and held. God is at work, whether you can see it or not. 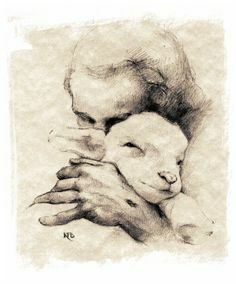 He holds your lamb to his heart and leads you gently as you wait and weep.